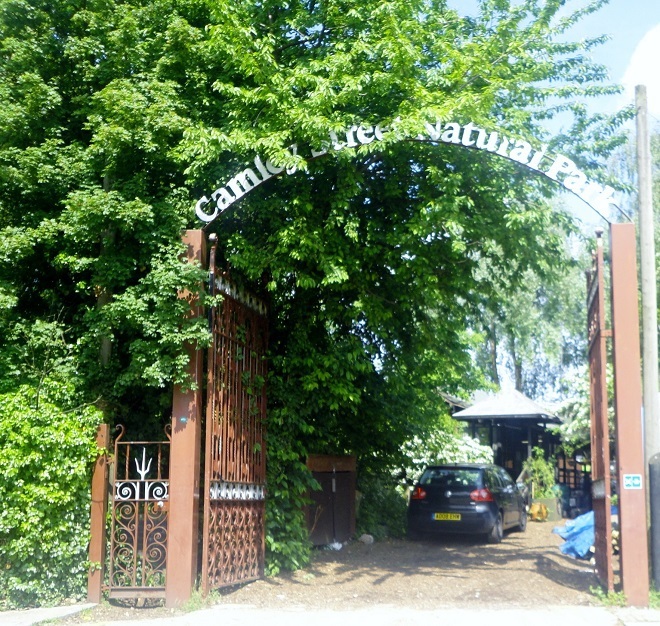 Camley Street Natural Park is bordered by the Regent's Canal on one side and the railway lines leading to St Pancras International station on the other. A few minutes' walk along Pancras Road, leaving the traffic jams and sounds of the busy Euston Road behind, brings you to this area of green and tranquility in the centre of London. 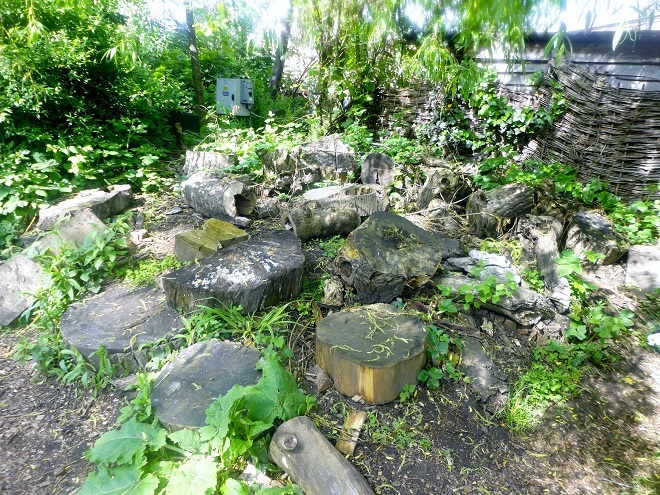 Local wildlife devotees campaigned to save the park's site, an old railway coal yard, from development in the 1980s and the natural park was established in 1984. 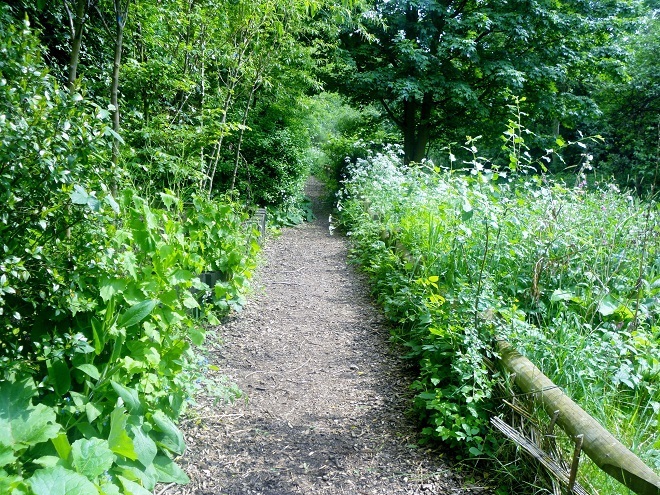 The aim of the park's two acres is to protect the wild spaces and wildlife of London. This is an obvious success as holly blue butterflies, Daubenton's bats, mallards, kingfishers, reed warblers and reed buntings now make their homes in the diverse areas of the site, whether in the meadows, woodland, or marsh. 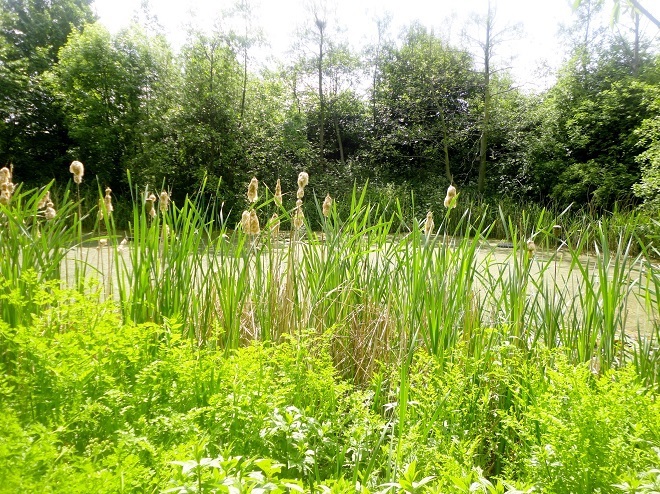 The pond is bordered by reeds and provides a safe inlet from the canal and a refuge for water birds. When I was there I saw a mother duck, with a crocodile of chicks swimming behind her across the pond and out of sight. You'll have to excuse the blur of the photo, but it wasn't easy to keep up with them. Fruit and vegetables are grown in the nature reserve, although I was told that the wildlife usually get to them before they can be harvested. There is an education programme for schools, especially for inner city children from Camden (the local borough) as they may not even have a chance to observe nature at such close hand. Activities are laid on during school holidays, and children are encouraged to take a net and examine what they find in the pond. Of course they have to return their discoveries once they have finished. 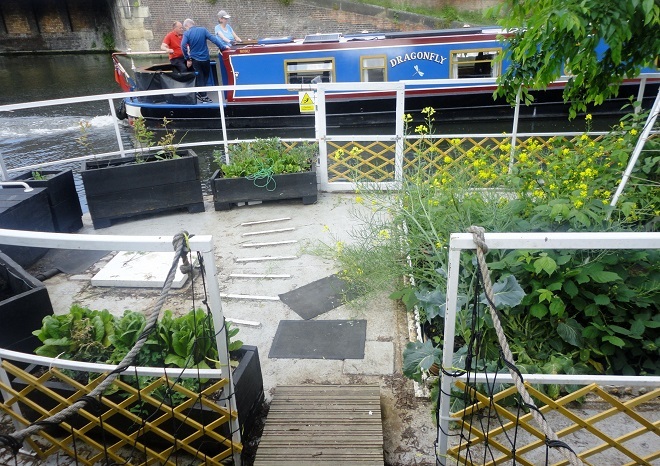 Whilst I was there I had the opportunity to chat to Martin, who is in charge of the stretch of water between the park and the Islington tunnel on the Regent's Canal, and he pointed out the floating garden that is moored on the canal beside the wildlife park. You can see it in the picture below, as a canal boat sails past. 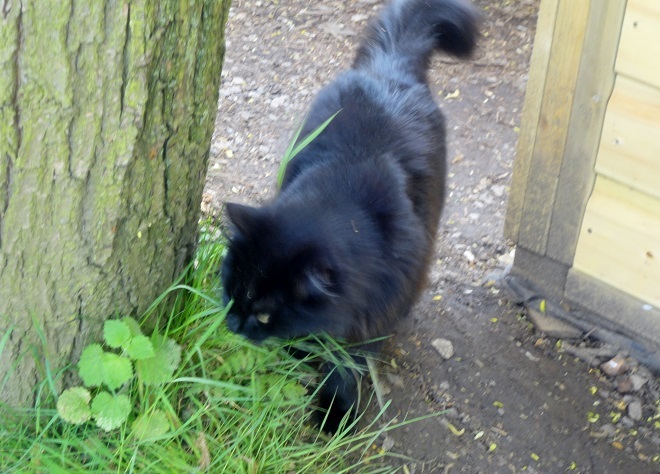 Even a local cat has taken up residence in the park, and he has to be trusted not to help himself to the small mammals and birds living there. If you thought that it wasn't possible to create such a wildlife oasis so close to one of London's busiest dual carriageways, and close to where the Eurostar trains depart for, and arrive from, Paris, you should come and have a look for yourself. And if you're really enamoured and have some time to spare, you could even offer your services as a volunteer. A final word: not everything is natural at Camley Street. 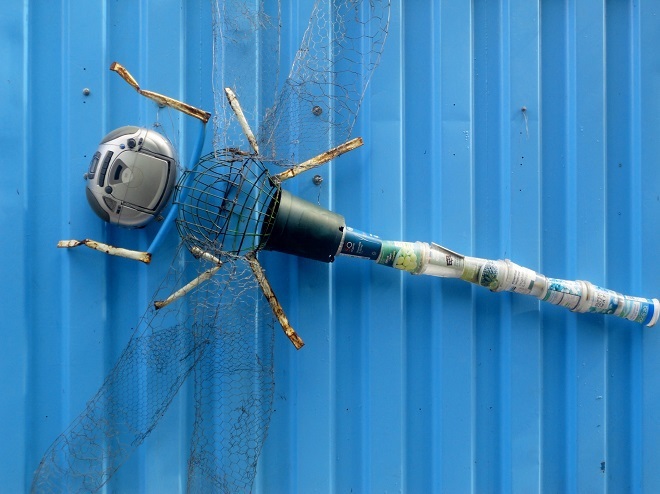 Take a look at this dragonfly. How lovely to see duckling with their mother. is a 'crocodile of chicks' a collective term? I've never heard that phrase before.